From tiny acorns it is said that mighty oak trees grow, and granted in the concrete jungle that is Manhattan, one has to be realistic about growth prospects. modestly and demonstrate that not only is the Big Apple awash with many talented traditional Irish musicians, it can come together in a special way to display much of that talent on stage at one time. The brainchild of the Brooklyn-born fiddler, 58, whose one-quarter Irish heritage is often overshadowed by his predominantly Italian characteristics — except when he has the fiddle in his hands — is regarded as one of the stalwart musicians in the New York Sligo lineage in the city. Early on in his musical education, DeMarco went into an immersion process initiated with his Brooklyn neighbor Paddy Reynolds (Longford) that led him to the Conway household in the Bronx and time with Martin Wynne and Andy McGann alongside Brian and Rose Conway. It led to a long legacy that went back to the fabled Michael Coleman from Gurteen in South Sligo in the middle of the 20th Century. Along with many masters from the Old Sod who were playing great music in the 1980s around New York and doing their best to pass on the music to the American-born, DeMarco relished the 10-year run of the Irish Arts Center’s seminal Snug Harbor Traditional Irish Music and Dance Festival that was celebrated on Staten Island for eight years before finishing its NYSCA grants-assisted run in the Bronx. When it concluded most of that creative energy and talent went upstate to revive the moribund Irish Catskills in East Durham at the Catskills Irish Arts Week and left New York City bereft of any trad festival to call its own. As a die-hard New Yorker, DeMarco felt that absence didn’t make any sense after traveling around the country and Ireland for other Irish trad festivals, so in the past year he set on a course to rectify that and see where it would lead. In place were a network of good weekend sessions that had established themselves like Lillies, the Brass Monkey and the 11th Street Bar (anchored by DeMarco himself) that would be conducive to inclusion in the emerging New York Trad Fest. In solidarity with showing off and celebrating the talent-rich New York area, Irish Consul General Noel Kilkenny opened the consulate doors to an opening night reception on Friday night to kick things off. Dr. Mick Moloney chaired a panel on Saturday afternoon at Glucksman Ireland House with musicians Brian Holleran, Dan Gurney, DeMarco and step dancer Siobhan Butler who assisted Tony on much of the work for the weekend. In interview fashion Moloney drew out from each of the individuals how they became fellow travelers on the Pure Drop pathway over the years. The legendary names of Jack and Charlie Coen, Mike Rafferty, Martin Wynne, Andy McGann and Paddy Reynolds were recalled with reverent nostalgia as men who not only loved their native music, but made major efforts to keep it above ground when they went below. (Thankfully, Monsignor Charles Coen is still alive at the age of 80 and was recently honored up in his Catskills community over the Columbus Day weekend). The centerpiece for the weekend and the major revenue source would be the Saturday night concert in Times Square. Connollys’ Pub and its third floor Klub 45 was a most hospitable venue with owner Bernie Connolly and his staff looking after some 30 musicians scheduled to play and 250 attendees attentively all night in a comfortable atmosphere. Not only does Connollys have a first-rate sound system designed by John Murray, the man himself was on hand to engineer the board in the professional manner that brings raves to Cherish the Ladies performances around the world as their personal soundman. The room does present some challenges in that is it long and narrow with a long bar on one perimeter, but those on the opposite side of the stage were able to view the performers on flat screen monitors and Murray made sure the sound carried equitably around the room. Since virtually all of the 250 capacity crowd were there to hear and see the mighty musicians assembled it was easy to keep focused on the action on stage. The frequent but efficient set changes allowed for interaction among the aficionados who came from near and far to enjoy the night, and the camaraderie added to the buzz generating all night for a concert that went on for almost six hours and held the crowd for much of that time. It was a testament to the fabulous music on offer all night and in sharp contrast to the old Snug Harbor days when most of the music came from the older immigrants; Mick Moloney, James Keane, Ivan Goff and Cillian Vallely were the only Irish emigres on the bill. 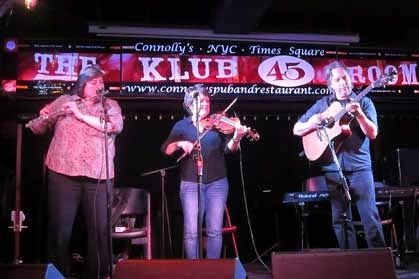 The rest was homegrown talent who keep New York the hub of Irish traditional music in America. The musically eclectic DeMarco also saluted the diversity of the local scene in having stellar musicians in the bluegrass and old timey scene like Alan Kaufman, Mark Horowitz, Kenny Kosek, Tony Trischka and Andy Statman on stage, and even a bit of Klezmer with Lisa Gutkin. Stepdancers Siobhan Butler, Kieran Jordan and Megan Downes also demonstrated that the dance music being played was true to its roots all night long. It was an auspicious debut for the New York Trad Festival which shows potential for the future in the Big Apple. We’ll allow DeMarco and Butler a respite and a chance to get away to Ireland to participate in the Sligo Live weekend coming up. They will also be participating in the Fiddler of Dooney contest and the Oireachtas sean nos competitions in Killarney the following weekend. Keeping the tradition alive may seem like work to some but for those who take it to heart that passion is really play.